In late November, news broke that a dual US-Syrian citizen was killed in detention in a Syrian prison, some two years earlier. Layla Shweikani (Arabic: ليلى شويكاني ) was a U.S.-born Chicago native, educated as a software engineer. But she went to Syria in 2015, ostensibly, to help displaced people in the Damascus suburbs of Eastern Ghouta. The area was run by Saudi-backed hardline Islamists Jaish Al-Islam, who apparently approved of her work. Other women activists there, like Razan Zaitouneh, have been arrested and killed by JaI for challenging their harsh policies. But it seems Shweikani was arrested by the Syrian authorities instead, and is believed by most to have been executed following on torture, and surely for no real crime except trying to help the Syrian people. Since I don't follow the news closely, my first view happened to be via Tony Cartalucci at Land Destroyer on December 15, panning "a particularly scurrilous op-ed appeared in the pages of the Washington Post" two days earlier which, he argues, lacked "any actual evidence" for the allegations. He also considers a report in the UK Independent, which featured more explicit evidence. But as he accurately put it, the source for that was "dubious activists relying on second and even third-hand accounts." - Washington Post article by Jason Rezaian (soon arrested in Iran, tried, and convicted for espionage, as noted). In this post, I'll offer a reasoned rundown of what we supposedly know, and what we don't really know, and what possibilities exist. Activists are pressing president Trump, with apparent futility, to impose penalties, and shaming the public and media for supposedly ignoring the crime. For example, rep. Adam Kinzinger (R-Ill.) told WaPo's Rezaian in early December “It’s disheartening that there not only has been no outrage over the murder of an American by the Assad regime, but that there has been little to no coverage on her story by our national media.” The story had by then been making limited rounds for perhaps two weeks, with little evidence yet and, as it turns out, emerging from the blue with zero preludes or prior reports. As people are guilt-tripped for silence over this crime, it should be noted everyone including her family, her government, and Syrian activist groups failed to make any public mention of the case in nearly three years since her reported arrest in February, 2016. WaPo: "She was being held in solitary confinement with no contact with the outside world." For some reason , even the people who knew she was in there didn't make one-way contact possible by speaking of her case. So she didn't make it into this source. Nor did her father, nor probably her fiance. A decent internet search suggests no one else anywhere reported her arrest or detention or worries, prior to the recent news. On Twitter, I found Tweets featuring her name in Arabic first appear, just barely, on November 26 of this year, come in heavy in the following days, and sporadically since. It seems no one spoke of her prior to that. I don't what this means, if anything, but it's odd. Detained activists are usually named as heroes and supported with protests, petitions, hashtag campaigns, etc. But here, a U.S. citizen activist and some family members are detained February 2016, contact was made with U.S. Government help 10 months later (see below), execution should have seemed likely or imminent (see below), and then contact was lost for two years, apparently with no clarification from Damascus ... and still no public note or complaint of the missing U.S. citizen, the detained activist facing execution, perhaps already killed. But the Syrian government just now (sometime in November) confirmed her death, on December 28, 2016, through an update to its civil registry. It doesn't say she was executed, or was even in jail, just that she died. Other information might well clarify that, but that information might be untrue, in whole or part. Then, suddenly everybody knows just when and where she died, and were able to speak about it. The explanation they'd give is they knew where she was and how she would have died if she had. But since the regime cruelly refused to confirm the killing, uncertainty over her fate and perhaps some kind of threats made them keep quiet about it (like maybe they would kill her as soon as anyone spoke up). In that case, perhaps a Syrian affirmation of hear death was taken as credible proof of something they highly suspected, and was enough to shake their tongues free. That's entirely possible, but I suspect the abnormal quiet is some kind of a clue to the hidden truth of this story. For now, it's just worth noting. Anyway, considering everyone else's silence for nearly three years, I don't feel so slow in catching the story and following up with this starter post that winds up just missing the mark of two years since her death, and one month after the first anyone heard of her. My main question in general with tortured detainees is whether they ever were prisoners of the Syrian government, rather than of opposition groups with their own genocide plans (see Fail Caesar part 6 for well-founded doubts even in those cases that have supposed photo proof). But here, it seems Layla Shweikani was held in Syrian prison, and did presumably die there, possibly in an execution. So the usual line of questioning is - barring a surprise revelation - out the window. Since Washington withdrew its meddling, hostile "ambassador" to Syria, Robert Ford, early in the engineered conflict, the U.S. pursued Shweikani's case through the Czech ambassador to Damascus, Eva Filipi. As the Independent reported, "ten months after she was first detained, on 18 December 2016, Filipi visited Shweikani in Adra prison on behalf of the US government." It's a logical possibility that ambassador Filipi fabricated this visit to help sow a false story of the detained American activist - especially considering the case of Robert Ford. But it's surely not an accusation I'm making. As a professional politician outside the Jihadist deception network (alleged inmates at the prison, etc. are always suspect), she's presumably trustworthy - on basic facts like this anyway. The government officials and reporters passing on news of her meeting are probably doing it correctly enough. Important context is probably left off, but I presume this visit was real, and so: Ms. Shweikani was held at Adra prison as of December 18, and the Syrian government acknowledged that fact by granting the visit that proved it. And unless she was released in the interim (which seems unlikely) the same authorities' claim she died somewhere, somehow, ten days later, means she died in prison. Execution is obviously one way that happens. In his report, Tony Cartalucci added some questioning of the WaPo journalist Josh Rogin, who acknowledged "we don't know the specifics of Layla's death ... Thank you for that caution. ... But the regime is responsible for her death, in their custody." From this, we can say Rogin is pretty sure she was in jail when she died, and can only claim general responsibility based on that. And that's probably accurate enough while the rest is, in fact, hearsay. And there's been a lot of that regarding Syria, that either goes untested or fails a test. Without explaining how this was known, the article claims the prisoner admitted to the leveled charges, but only after "Shweikani had been threatened by Syrian authorities that they would harm her family if she did not confess to the ambassador to the crimes she had been accused of, which she then did." If this is true, she said in the meeting that she was guilty. The claim that this was extracted under threat is suspect; there's little reason to know what happens inside torture chambers at Adra prison. Was this just a guess? What were the charges? Most sources are vague, saying it was related to "terrorism." But Richard Hall wrote for the Independent how Layla was arrested sometime in February, 2016, "along with her father and her fiancé. She was charged with planning to assassinate members of the Syrian government." "Since there was no official confirmation of her death at that time, Shweikani’s family still held out hope that she was alive, and that she would be released. From the time they lost contact with her at the end of 2016, the Czech ambassador continued to make enquiries about her with the Syrian government and the case was followed by the then US envoy to Syria, Michael Ratney." That sounds like it's missing something. The Americans must have been given no clear answer? Why would Damascus deny a supposedly valid execution for terrorism? Did they actually send an answer but the Americans - for example - "misplaced" it, in order to maintain the illusion of a horrible injustice and cause for yet more "pressure on Damascus"? There are open questions here. Another way of looking at it; a US citizen was allegedly involved in assassination plots in Syria - and no one mentions her detention, least of all the U.S. government, until Damascus brings up her name first in 2018. That could be coincidence, or might help clarify what caused that unusual silence. "What happened next was discovered by Idlbi through testimony of other inmates at Adra prison, where she was held, and contact with Syrian officials after the fact." The trial part would be internal. It would almost require a functioning insider to witness it or know a witness. Luckily, Idlibi claims, there was an unnamed official sympathetic to the opposition who knew of these details and leaked them to this researcher. It's not clear when he pulled this convenient trick, but presumably well after the fact. These details would make her death pretty certain, as they seem to do now. Yet for years, this info was apparently not available as "Shweikani’s family still held out hope that she was alive, and that she would be released." I suspect this 'sympathetic insider' only 'stepped forward' in November 2018, as if to bolster the government's new listing, as if he had no clue before, or maybe had just forgotten until the registry update jogged his memory. But it seems likely he only handed over these long-quiet details, to support more opposition claims, in the days before Idlibi would finally 'reveal' his own ongoing research. Otherwise, this "researcher" Idlibi relies - as many other opposition propagandists do - on alleged prisoners who saw detainees here and there, and bring this up upon their alleged release. In this case, I suspect all such source were 'released' suddenly in late November, 2018, just as that official came out to help Idlibi with his big debut as a world-stage research guy. "According to Idlbi, Shweikani was then transferred to the infamous Saydnaya prison, just outside of the capital. “Since then our assumption is that she was definitely killed. Because usually you are executed within 48 hours [of a verdict],” he says." So it was illogically that "Shweikani’s family still held out hope that she was alive" - at least, once this presumption was formed (just when is unclear - when someone who saw it was allegedly released?) And from that point forward, this outlandish fantasy somehow underpinned their continued public silence, until the regime finally admitted it on their own. Furthermore, the presumed date, known since whenever, happens to match exactly what they Syrian government had just confirmed - December 28 (transferred Dec. 26, usually killed within 48 hours). Are they really that predictable, or is this a fake prediction fitted to the revelation after-the-fact? The latter option remains open anyway, since Idlibi waited two years for this regime confirmation before raising any public complaints. As Cartalucci notes, Idlibi's status as an opposition member means he lacks neutrality as a witness and further, he might be repaying favors to a hostile state; "Qutaiba Idlbi lives in the United States after receiving a scholarship to study at Columbia University," as Cartalucci found with a bit of his own research. I can add it says Columbia student right on his Twitter profile. More research on this chap may be in order. But even as I'm sure Idlibi is researching me now (as if that matters), I probably won't bother much. My questions are those raised here, and digging around won't answer them. Some discussion with him might provide clues, however. I am going to pursue that. There are also standing questions over the government's actions. At least as the stories imply, her family was never informed, obviously not given her body. Washington and the Czech ambassador pursued the case, we hear. They must have been misled/uninformed over the execution. I'm not convinced that's the reality, but it could well be. There are different possible reasons, some of them reasonable, why Damascus might stay quiet on this execution in particular. But certainly that secrecy would feed into narratives like those circulating now. And let's consider the troubling precedents and prior allegations that make these stories seem likely enough most won't even bother with specific evidence. What we think we know about Assad's secret prison killing machine includes mass arrests of innocents, inhumane conditions, routine torture, false confessions, and mass executions, thought to have been ramped up lately. This is; all alleged, with the allegations widely credited. Like most, Layla is said to have been killed at Sednaya prison, the "human slaughterhouse" as decried by Amnesty International in a report I considered here. It's widely accepted there must be a system to this mass killing, some order for it coming from on high. There probably should be, if it's real. In fact anti-Syria investigators have gathered close to a million pages of top secret documents seized from overrun government facilities, etc. But despite the public bluster, these "Assad Files" apparently reveal no such orders. The best examples they can find to even suggest it note some beatings and some torture have occurred in Syrian prisons. But officials are only seen - talking candidly and secretly between themselves - calling these "mistakes" and ordering that it be stopped. Oversight is proposed. Some deaths by disease are also noted; officials secretly suggested more attention to cleanliness to minimize that. (see here) The orders TO starve, neglect and mass exterminate the prisoners ... yet to be found, just like the orders to shoot or arrest peaceful protesters. "Part of [WaPo reporter Josh] Rogin’s diversions included references to the 2013 “Caesar photographs,” which Rogin would claim were “verified” by the FBI. US Representative Kinzinger is also fond of invoking the photographs which were allegedly smuggled out of Syria and reportedly depict Syrians "tortured then executed" by the Syrian government. " "What Rogin failed to mention was that the photographs were “verified” only as undoctored by the FBI who never once stepped foot in Syria to investigate or verify the identities of or circumstances surrounding those depicted in the photographs." This is true and well-put. They are genuine photos, mostly or all taken at an official location in Damascus near Assad's palace. But where did these thousands of real and emaciated bodies come from? I've made a huge project of analyzing these photos (not all published, but a lot of work is collected here). For a nine month span, the bodies came thorough at a rate of about 1,000/month. This is a huge crime. The circumstances deserve careful consideration, not the easily-convinced, almost kneejerk Assad blame they were greeted with. Some photo evidence and considerable logic suggest those thousands of men and boys (and one woman) were prisoners of the local terrorists (see again FC6). Most likely, that would be the same Jaish Al-Islam that freely kidnaps non-Sunni civilians and uses them how it sees fit (see Fail Caesar part 8), and also seemingly approved of Layla Shewikani's work with "displaced people." Knowing they had a sympathetic insider at the morgue end ("Caesar"), I think they killed off most of the huge number of prisoners they held, forged "regime prisoner" numbers on the bodies they dumped for the government to process as unknown. Then, I suspect, the insider "confirmed" those numbers with his own unofficial morgue photos of the victims, to make it all look official. Even many opposition sources support my hunch that most of the victims are captured Syrian army soldiers and the like (allegedly, they had "tried to defect" - see here). So there's little documented reason to be sure this torture-killing of innocents by the "Assad regime" is a real thing, let alone the obvious explanation for Ms. Shweikani's fate. We should still be applying some skepticism to the specific evidence and, as we see above, finding it doesn't hold much weight on its own. It needs these precedents to be real, but they probably aren't. At least some detainee stories seem to be simply made up, or grossly embellished. Consider the case of Nabil Sharbaji, arrested at the uprising's start in March, 2011, but quickly released, detained again in Feb. 2012 for helping start an opposition newspaper, and held for longer. In late 2012, he allegedly wrote down the names and details of some 82 cellmates at Adra prison - in blood and rust with a chicken bone, on scraps of rough cloth, and seemingly illegible - as highlighted in a presentation and documentary film sponsored by the US Holocaust Memorial Museum. As it happens the 82-names list - some pile of cloth - was allegedly hidden in the cuffs and collar of one shirt and smuggled out by Mansour Al-Omari, who also ran the VDC's detainee database (that never listed Layla). According to this man and that database, Sharbaji was never released after the second arrest; he kept sending out notes from the regime prisons (mostly with ink and paper and smuggled in unspecified ways) long enough to disprove rumors he was killed in April. The notes continued up to August, 2013, with sightings and an alleged prison visit in October, 3013. But then there's no news I could find for over three years before, in late 2016, the same Mansour Al-Omari revealed how his friend Nabil had been killed two years earlier; "He died in the Saydnaya military prison after a jailer kicked him in the chest" on May 3, 2015. This would have happened two months after Sharbaji was reliably identified (March, 2015 - see second VDC martyr's entry) in a "Caesar photo" looking like he died of suffocation. But it's dated February, 2013, and no Caesar photos show bodies later than mid-August of that year. (Alleged sightings continue into October - just long enough to 'clarify' he lived past the photo collection.) But that really looks like him, and timeline analysis supports this is the right basic time for that body number to pass through, probably about two weeks after that murky third arrest. Unless the ID is wrong, he was dead before most of the smuggled notes attributed to him, and some of the alleged sightings. He might still have written that famous 82-names list before he died, but you know ... I just don't buy that either. I find that evidence almost ludicrous in and of itself. It's worth remembering Nabil at this time, and wondering how widely this kind of embellishment happens. Maybe something of the like plays into the stories about Layla Shweikani's death for no crime, under systematic torture ordered by the brutal Assad regime. I turn belatedly to the public debate regarding the 2017 Khan Sheikhoun incident, held earlier this year between MIT professor emeritus Theodore Postol and the Atlantic Council-backed open source investigator and Bellingcat founder Eliot Higgins. This happened back in October at the Centre For Investigative Journalism (a pro-Postol news story for some overview), but I've skipped a few chances to see it for time limits. Recently Kevork Almassian's Syriana Analysis posted a full video that I finally watched (here's Ted Postol's from November 28). Almassian's readers seem to take Higgins as clearly losing the debate to the credible professor of arms and security study. I wish that were so. But rather, it's something of a mess, from which I can call no clear winner except ongoing confusion. Both men display a primarily unproductive, unprofessional tone, like accusing each other of abetting war crimes. Obviously one of them is, knowingly or not, but that's best left unsaid, or said more like that, as we focus on the details of who's right (has the better, more factual case). But even after some review, that's hard to call just from the debate's contents. It's mainly other information not mentioned that clarifies Dr. Postol is far more in tune with the truth of events. I liked the host, James Harkin. He tried to make it more useful. And in the end, there is use to be made of it either way. In some spots, I'm just the one to settle the noise and get the clearer picture. Other points, noted - not so much to add. Other points (not mentioned) - hopefully not too important. Postol is widely respected, if also now widely detested, for his contrary analysis of events in Syria. His authority and findings make him one of the most cited (by some) experts on any subject he weighs in on. I stand by his overall work with the late Richard Lloyd over the Ghouta incident in 2013. That work on rocket firing ranges and other details remains great and relevant. Eliot Higgins was eventually convinced of their findings on a range limit of app. 2km, despite early assurances by the White House and other parties assuring us they were fired from a government missile base about 10km from the impacts. But professor Postol since, on his own... I don't know what all he's done. I just know mainly what he added for this 2017 incident, and that not completely. But from what I've seen, this is mixed, and the mix has a lot of bad. In fact, calling that out is one of the many things I'm behind on, and I'll take this chance to clarify my gripes once again. I don't exactly agree or disagree here, with no real expertise or clear feel on the debris, I will cover this quickly. 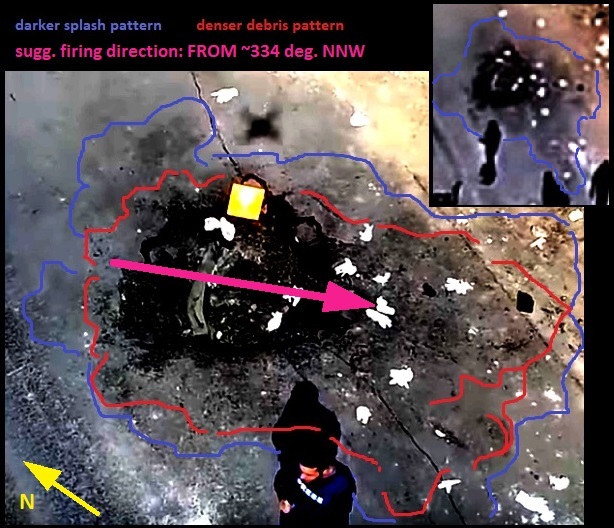 Further, Postol's analysis doesn't identify the weapon by any details, just shows how basic rocket casing might react. And as Higgins noted, he's used another explanation for that before (the surface-laid pipe bomb theory), and backed that with appeal to authority, firmly claiming any expert should agree - even though Postol himself now doesn't. He shouldn't have done that. But his current take: maybe. No Sarin Release at the crater? 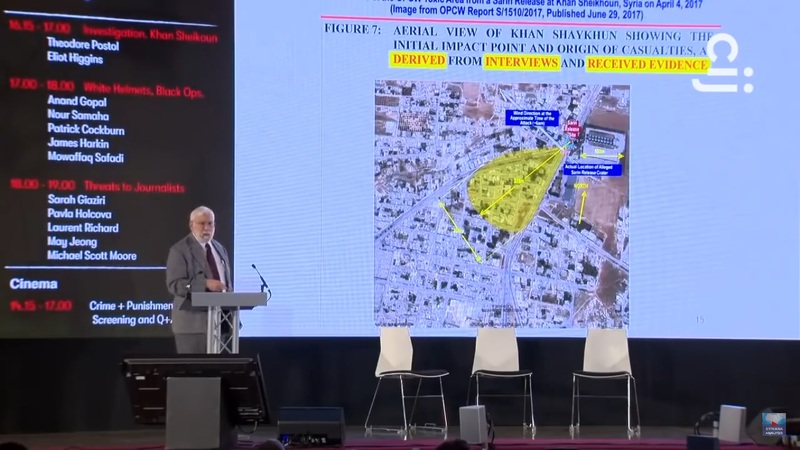 Postol argues there may have been a release of sarin, but not at the famous crater investigators accept as the sole release point. This is based on that weapon NOT containing sarin, which seems to be deduced from it being a rocket, not a Syrian CW bomb. But what if it was a rocket with sarin? Or what if we was wrong about it being a rocket? 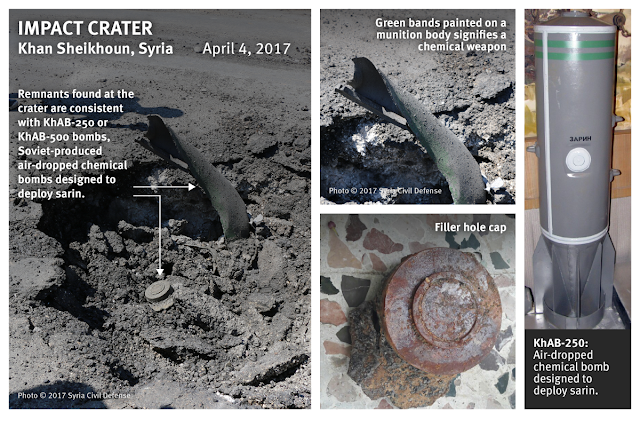 This decision seems to gloss over the important fact that the crater, debris in it, and surroundings have all tested positive for sarin. The could be planted, depending. But there's an odd black splash around the crater, looking impact-related (sugg. direction in magenta, from NNW). This black splash is also seen with some other alleged sarin attacks (see here). So that might suggest a release here, but limited; it would mostly splash on the ground to turn up in tests. Only a few droplets would disperse, and poorly so. But then I'm not sure this is the case either.I would agree there's room for serious doubt about the widespread release of sarin. But I see no reason to doubt this spot in particular. Rather, it may be the only area sarin was released (other than inside at least some of the victims), in a limited special effects application of the stuff. https://twitter.com/MichaKobs/status/1068884235921121280 "the "result" was the precondition." 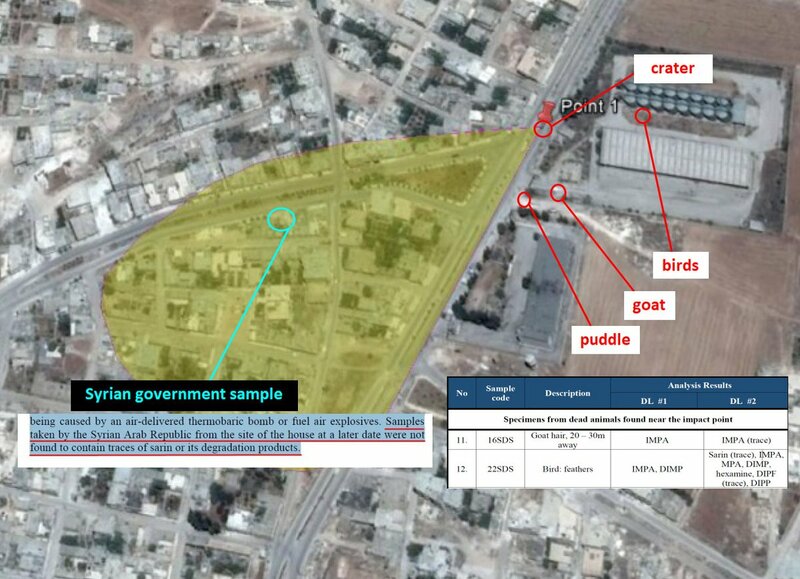 note: "Syrian government sample" refers to one of several collected by a Damascus contact in town, including one showing sarin at the crater. OPCW accepted those samples as well-documented enough, like they did for samples supplied by the "White Helmets" and affiliates. They found this negative finding natural, since it was a conventional bomb blast. But it was a blast of that kind right in their sarin kill-zone, and it had no sarin. 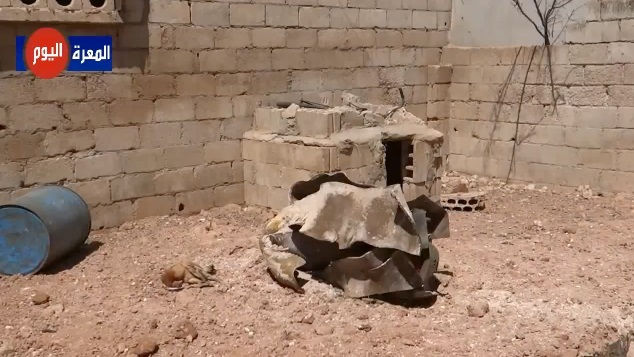 This is not very clearly at one sample from the kill zone - and seemingly zero from opposition sources - and that being at the site of a bombing that might potentially erase or prevent sarin traces from appearing right there. But to the extent this says anything, it suggests there was no wind to the southwest, nor any gravity-driven spread to the SW from that one accepted release spot near the grain silos. That might matter, if there's other reason to doubt this dispersal pattern. In fact, all visual evidence is pretty clear in showing a wind to opposite of what the opposition's narrative needs. People died to the southwest, they all agree, but videos show the wind blew to the northeast - at upper and lower levels and, to a less certain extent, at the ground as well (see as needed Overview - wind explainer). The following graphic is slightly dated/incorrect, but not by much, and quite snazzy. The more refined reading is like this at upper levels, favoring the eastern half of this green range, and probably a bit more easterly (TO the east) at ground level, besides slower and more variable. See here for clarified findings, movement graphics, more explanation, AND the right space to lodge a challenge (none lodged there - nothing of value lodged anywhere). The correct direction is close to - and probably is exactly - the opposite of the one reported by anti-government activists and alleged survivor-witnesses. That's likely because exactly opposite is an easy error to make, as Dr. Postol, for one, knows. Early on, he found a prediction of a SE wind (that is FROM the SE blowing TO the NW - stated in the proper but easy-to-misread format) and took it as a wind TO the SW. See first backwards readings here or here). Then Postol learned of the error (thanks to my research associate Charles Wood) and showed the unreliable prediction correctly (see here) - TO the NW (that part was AGAINST Charles' advice. He suggests what I did, with his help - use reliable airport METARS data if useful enough (debatable and varied) or - if possible, as it was here - analyze the video record. This actually shows the wind in question - as it happens, well enough to be read for a consistent answer.). That's one person's mistake, of course. In contrast, I think the Syrian activists the UNHRC and OPCW chose to believe started with the accurate reading of a SW (origin) wind. It could be one poorly-chosen person "pulled a Postol" - read it backwards in the same manner - as he sketched a map of where to say people died. Then others used that reading, without review, to set up their unusually detailed story of sarin dispersing TO the southwest, complete with tear-jerking returns to the wrongly-place sites where some men claim their own family members died. I've been following Syria CW alegations since December, 2012. In all I've seen, they rarely, almost never, report this kind of detail, at least not this widely and clearly. It might come out in an OPCW report, but isn't spelled out acted out as the downwind kill-zone from the first news stories onward, as it was in 2017. It feels like a special trick, and according to the video record, they somehow set it up backwards. I guess this remains esoteric to most people, but to me it's a very powerful point. Postol is one of the many who doesn't get it. He took that SE-NW prediction, first backwards and then read properly, and he's stuck with that since, up to October anyway. In the debate video, at 8:50 he shows this slide, still claiming a wind to the northwest as something no one has noticed. But this isn't the real wind. If I had that vs. poisoned people to the SW to choose from, I'd be pressed. This from the UN-OPCW JIM might sound reasonable: "...the location of victims, as described in the report of the Fact-Finding Mission, serves as an indicator of prevailing air movements west to south-west of the location of the crater during the early morning of 4 April 2017." But I'm not so pressed. 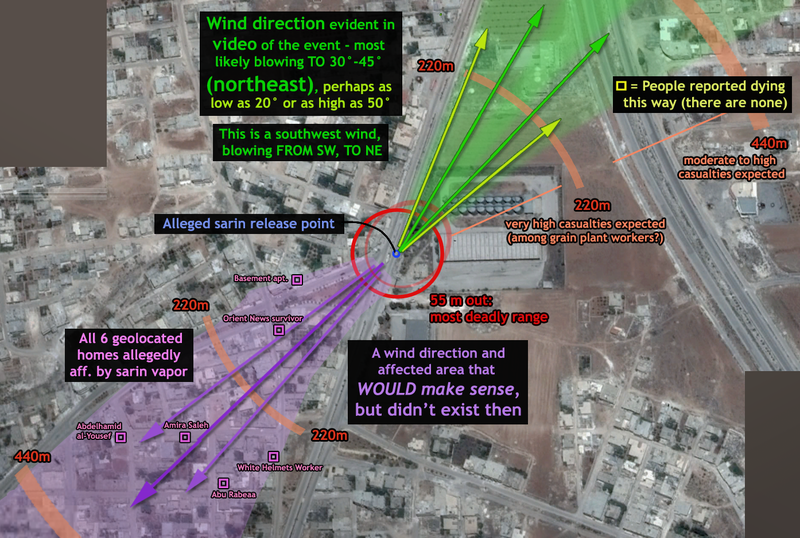 I've seen the OPCW claim virtually no wind and mischaracterize the topography to explain the SW spread as driven by gravity (in fact it would roll west, not SW, IF there were no wind). I've seen activists claim a wind blew it that way. I've seen the JIM decide the dead people simply show the sarin spread that way somehow (that is, their presumption that the claims are true means it must all add up, but they don't want to specify how). And I've seen the video - the most reliable evidence there is - saying there was an active wind opposite of what the story required. In fact, at 13:50 Postol himself notes (as he has in the past) the video shows wind partly to the east. Yes, and the other aspect you can adduce with more study is to the north. Why he disregards that in favor of a contrary prediction - that is thus proven inaccurate - I do not know. Wrong damage claims: totally wrong. Here Dr. Postol displays an embarrassing lack of thinking through, as I had to explain in some detail here back in June, 2017 (see first part, refuting Postol). I'll explain this below and then come back to it in another section. At 14:40, he explains how, basically, the video shows 3 blasts - somewhere on those 3 singular lines of sight - that are much bigger than the damage shown in satellite images. He decided these must be 500-1000 pound high explosives (HE) bombs, he thinks, which would have flattened entire buildings, in contrast to the seemingly minimal damage seen after (and from space). Higgins is correct to ask how Postol decided the bomb type and power, and to challenge the "calculations" behind that (40:08). The implications make no sense. The issue wasn't resolved there, but consider: we do see these plumes, so something must have been blown up on each line of sight moments before that video was taken (along with other videos). And also - as Postol should know by now - each plume is along at least one other line of sight, which puts them in exact spots where the lines meet. Or, those lines being estimates, we have 3 narrow areas to look for those flattened buildings he predicts. But they do not appear. As he notes, satellite images taken a couple days later show the triangulated locations are only lightly damaged compared to February images. Here's the tiny damage at plume 2 (second from left above), as seen from space (orange box on the right, compared to same area in February, via NYT). * BY early on 4 April (video from no later, perhaps earlier) those huge plumes had happened. * BY April 6, the above damage existed (and limited damage at the other 2 suggested spots). Imortant point; the damage seen from space is a bit misleading; up-close images show fairly serious damage at each spot. This tiny hole under plume 2, to be fair, is also the least clear of the 3 even up-close. Below, that damage from just inside that tiny hole. An outer brick wall had covered those old openings entirely, but this was mostly blown out. 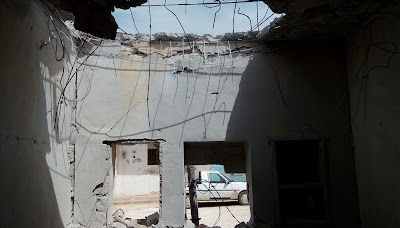 Nothing worse than this happened here; roof punched through, walls chipped, outer wall pushed out, room contents badly jumbled and damaged. If this is too little damage for a 500-1,000-pound bomb (I presume that's so), then something smaller was used here. And considering there's no other nearby damage to explain the smoke plume that morning, we could presume this smaller damage was incurred in the 4 April incident, and yielded that smoke in its mushroom cloud shape. Does that make sense? I suspect so. I'm no expert, but a smaller fuel-air explosive - coming in from the north, it seems to me - seems like a better explanation than a bigger HE bomb or rocket. - fake plumes videos? This is possible but very unlikely. No one has clamed it yet, and I doubt Postol would. Multiple videos from different angle would have to be staged. - fake satellite images? On-site videos show the same damage - these would also have to be faked. - Or... did Postol just make a bad presumption, based in incomplete knowledge and a 'momentary lapse of reason' that somehow got etched in stone? He seems confident in the calculations. I suspect the math was done right, but he did something wrong in the set-up, the presumptions. Because this doesn't play out very logically. In relation to that last we could ask if he's made other such errors, corrected or not. The wind thing is understandable enough, and was corrected. The error shown at right, I believe he corrected, but … what an error. 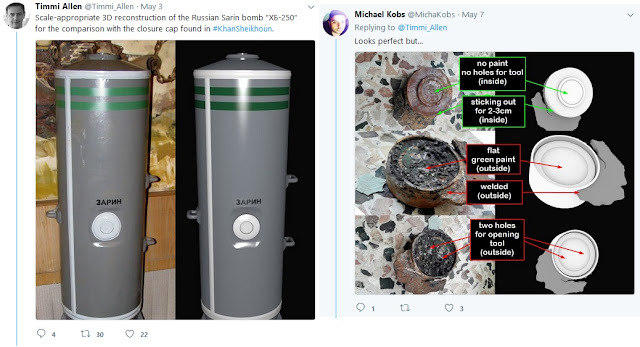 He read details on a 2013 CW incident (mentioned in a 2017 French intel report for yielding the same kind of sarin as in the recent KS attack), then took it as a conflicting story for Khan Sheikhoun in 2017 and made this graphic to clarify the non-point. I'm guilty of rushing ahead too sometimes, but it doesn't wind up confusing as many people, and I try to correct errors when I can (and/or note the corrections in all the right spots … time allowing, and energy …). So I reasoned maybe Dr. Postol just needed a tip, and so I also took these points to him directly in a private e-mail in June, 2017. It didn't go well. When he didn't respond after six days, I prodded him with a bit of provocation that backfired; he refused to look at the info, apparently because he didn't like my tone (before that he was just too busy for even a quick note of receipt). As a trusted expert with the right basic view on things, or appealing to and people with such a view, and as someone who should have the best readings on such weaponry-related issues, it's unfortunate Dr. Postol is promoting such flawed arguments. This kind of disagreement isn't very helpful in promoting the cause of truth, but neither would be my ignoring these widely-disseminated errors. The other side can spot them, and take it as a sign there's no valid questioning of the status quo - even the "conspiracy theorists' top experts" issue easily debunked nonsense. And even if they couldn't spot it, getting things right still matter enough to … well, get things right. If any reader gets what I'm saying and is in contact with Dr. Postol, feel free to pick up where I left off on a bad foot. It would be better if he didn't stay so wrong forever. Of course Eliot Higgins is a promoted propagandist, taking every chance to make allegations against Russia, Syria, etc. appear to be supported by the evidence. 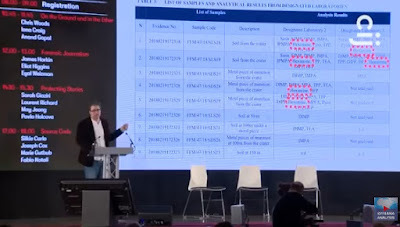 Technically speaking, he and the Bellingcat collective he helped start produce some great and valuable findings, besides some proven crud - on the technical end. They also ignore a lot, fail to establish a lost of inconvenient facts, and make a lot of poor use of good findings toward politicized ends. It seems to me they simply launder fake evidence in some cases, and I wonder if they can do that so widely and be unaware of it. If I were pressed to call a winner of this debate, I'd grudgingly give it to Eliot, on account of sharper on-topic debate skills, besides better (if ultimately dishonest) grasp of the broader evidence (partly: youth. More important: vaster resources and support network). And I'd note that with Postol wasting most of his time presenting the above erred points, the victory doesn't mean much. (it was Maram Susli, IIRC, aka (shifting combos of Syrian, Girl, and Partisan)). That might have been going somewhere valid, but it didn't feel that way. The hexamine aspect is involved; I'm not up to speed on that and can't add much. Postol claims if hexamine is a regular ingredient in the regime's unique sarin formula - as Higgins and co. assert - it should turn up in every test, rather than just in some cases. Higgin seems to disagree or be unsure. I'm just unsure. 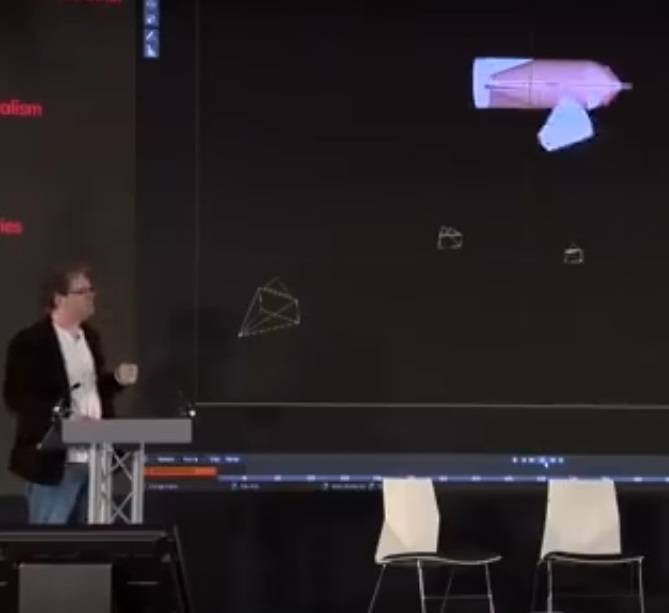 Higgins seemed most enamored of hexamine turning up alongside some sarin traces in samples from a 24 March attack (about 2 weeks before Khan Sheikhoun and not far away). But it seems from my limited review that's not a finding to be proud of. If intact sarin was still present about ten months later (as I recall - I need to review this case), I think that means someone planted sarin on that material way after the fact. But Eliot Higgins be like no, that must make sense. But Higgins liked how the same chemicals he thinks points to the Syrian government turned up in the specially-designed sarin bombs only they could have dropped from their jets. 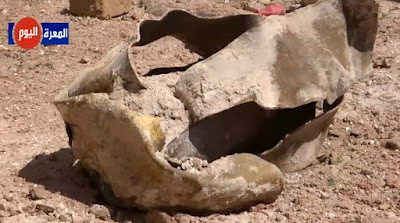 This odd event, the next day's reported chlorine attack, a 30 March attack involving sarin - all around the cave hospital south of Al-Latamnah - all have evidence, including weapon remnants, that play into his weapon identification saga for 4 April. Various pieces are shown de-crumpled by Forensic Architecture, re-assembling into what could be the back half and some other parts of the M-4000, a Soviet-made bomb, apparently designed for delivering sarin. 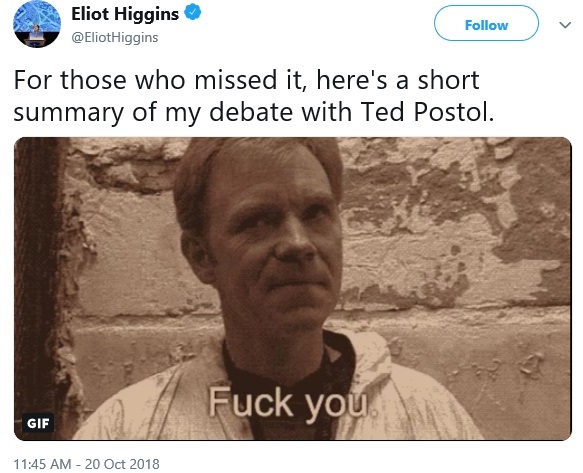 Postol claimed to see no value in anything Higgins presented, including this. But the computer forensic work (that he was given professional help with) seems impressive, finding a multi-part match. Just from this presentation, and aware it might have fatal flaws, I'd say it might be a M-4000. Now Higgins shows off only how they eventually ruled this out the KhAB by having the wrong size of cap (besides being beveled wrong or inside-out, which he doesn't mention). See 29:30 in the debate video. There are details of the later M-4000 ID I didn't follow, but I don't feel like catching up now, or going into any of the visuals. 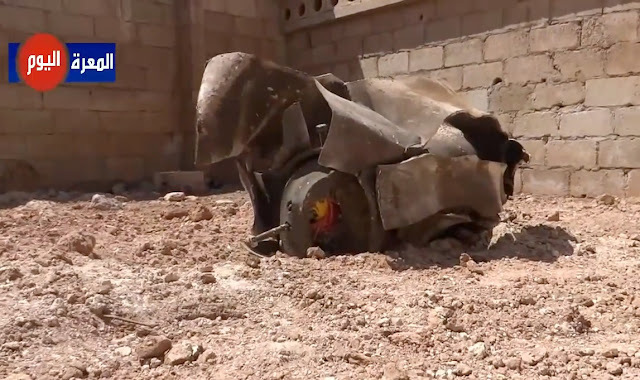 So putting these aside, let's say maybe those remnants are from just such a weapon, at least in the central case in Khan Sheikhoun on 4 April. Let's take the idea for a serious spin anyway. If so, maybe this bomb was dropped by a Syrian jet. The motive and rationality of it remains debatable, but let's say they made that decision and followed through. I say maybe because we have to presume there was at least one SAAF jet close enough - closer than 5km - that even the UN-OPCW's JIM missed, looking at radar records from two sources. The best they saw was one jet "depicted as flying in a circular loop pattern in the vicinity of Kafr Zayta and north-east of Khan Shaykhun. The map indicated that the closest to Khan Shaykhun that the aircraft had flown had been approximately 5 km away." An expert told the JIM a bomb dropped from that distance could hit the target, depending on unspecified variables. Based on that, they decided said variable were probably met and this happened. But as I reason it, to hit the sarin crater alone, it would have to fly towards it and release the bomb perhaps a few kilometers away, with enough speed the bomb would travel on that line (inertia) for the adequate distance before losing all forward velocity and going into its final dive straight down. Even if the jet turned away from the target at an early drop 5 km out, it would be going quite fast - and still straight at the target - to have the right bomb inertia to hit from an upper 'maybe' range like that. Turns at speed are so wide the jet would still pass nearly right above the impact spot before the turn is complete - so it would pass much closer than that 5km release. So if 5 km is the closest it ever got, and it was on a line towards the crater at the time (unclear), it must have dropped the bomb further back yet, and it can hardly be close enough to have hit that spot. But just what distances and directions remain unclear to most of us. To be more sure we'd need to have a credible expert analysis of the reliable radar data. I think even crunching the numbers on turn radius, etc. based on such limited info would be waste of time. Unreliable radar data: seemed to show the jet passing about 3.5km south of KS at the closest, on a mostly east-west heading. I've shown this around as suggesting n o jet came close enough or on the right heading. 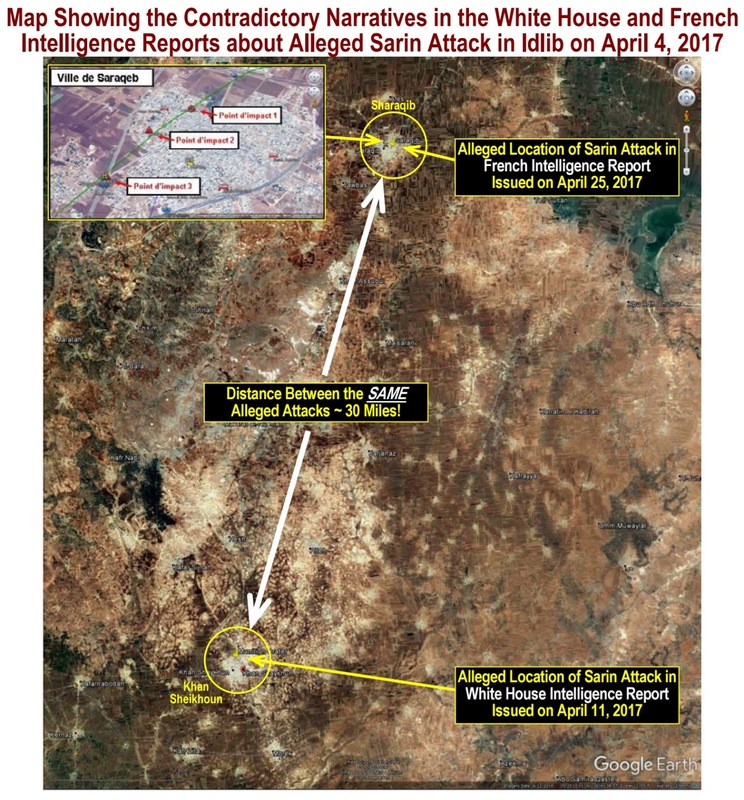 However - correcting for an initial offset and presuming no other distortions or trickery, that path puts ONE jet passing right over the sarin crater, on a heading to the SE. (complications explained and addressed here - inviting help on this point). But I'm not presuming no other trickery there, and the JIM's vague 2 record description seems a bit more reliable here. Not over the crater, never closer than 5km from (what part of?) town. So maybe there was motive AND means: a jet close enough/on the right heading. 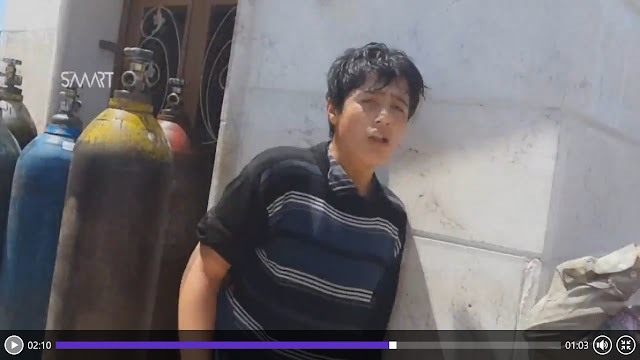 If so, we could presume that jet dropped this bomb, with sarin, right on that spot. Still it would not spread sarin to the given areas. Rather, as I explained above, the wind would push it exactly away from those areas. It seems site sampling bears that out. So something else must be wrong. But in this scenario where these are M-4000 remnants, Higgins has correctly identified the weapon ... that cannot explain the crime anyway. Otherwise, this event serving opposition purposes, they might have engineered it by - for a grim but most likely example - gassing some hostages. There are numerous possible signs of this in KS and other cases, and foreign-backed Islamist forces regularly kidnap minority civilians, on a scale that isn't fully clear. That plus firing in some evidence of an airstrike, and sowing a story tying it all together, could do the trick. Especially if they added a fancy victim pattern perfectly matching the wind direction at the time. Right? Those are the logical possibilities remaining after Higgins' best efforts to uphold the Assad-blame narrative. He's a sharp chap, but ultimately, you can only go far without the support of actual truth. The clever tricks start to wear thin. This wasn't shown as clearly as it could have been in this debate, but it remains evident enough. Accepting further thought, including on the points I didn't have much to add to, or didn't mention. This gif plays over and over. That's his own summary. "52. The launch of a projectile from the ground would not explain the 200 to 300 victims suffering from chlorine exposure. .." Why not? If it falls from above before releasing, there should be no difference, if the device holds the same amount in either scenario. Further, as the commission noted, it's not really clear that many were actually affected. "While the exact number of patients could not be definitively established, it is obvious that large numbers of people were affected by toxic chemicals." And that unknown number is definitely too big to be cause by anything but chemicals dropped from a government helicopter? Of the 5 considered, three were ruled inconclusive (Gamba interview), and by its treatment in the report, 18 April sounds more like those than it does like the solid and well-founded 21 April attack here. So this is the clearest it got. Here in a December 2014 report from just the OPCW, it's one of a slightly larger number of considered attacks. 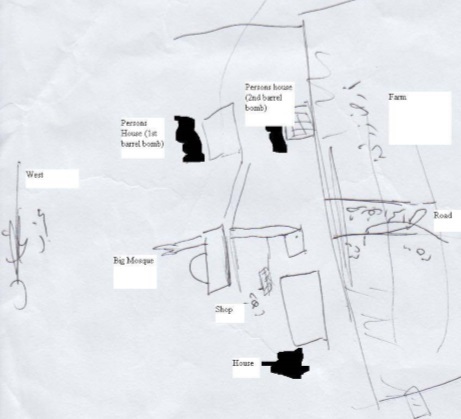 A sketched map from the December report - barrels dropped, it seems, just a stone's throw from the minaret. But that likely means nothing (I don't think locations matter much here, but I will double-check this detail at least - the coordinates are given in reports). "The family living in the first house lost a seven-year-old boy, who died within a few hours of exposure, and a teenage girl, who died on the third day after exposure. The other family members were also severely exposed ... Though the seven-year-old boy was some 15 m from the point of impact of the barrel bomb, there were no signs of physical trauma on his body, which had developed cyanosis and, as explained by interviewees, “turned blue in colour”. The Mission was provided with a photograph of this dead child; the body lacked any signs of physical trauma." There's a dispute over the deaths here: Point # 20 explains how the Syrian government "provided the name of the owner of the house that had been targeted … The name corresponds to the name of the owner of the house at location #2. The Government had stated that this person had died in the attack; however, this person was interviewed by the FFM several months after the attack..."
or, as point 51 clarifies, again, the government says the attack at site #2 "killed the owner (name provided) and his child. However, a witness interviewed by the FFM later identified himself as this person (i.e., the owner of the house and father of the child that died in the attack)." The government heard one man and one child died, but the accepted story is two children and no adults, with the reportedly dead man as one of their sources. One could presume the government's information was wrong or a lie, or perhaps that interviewee was an imposter, and perhaps neither of the children that were reported were even from that house. "In the second house, the family members who were home at the time of the attack and inhaled the toxic chemical suffered from severe medical effects and required medical care. The matriarch of this family died as a result of this exposure on 25 April 2014, in a hospital outside the Syrian Arab Republic." "Photographs and/or autopsy records of the seven-year-old boy and the teenage girl from the first house, and of the elderly woman from the second house, were provided to the Mission. The Mission was also provided with autopsy-related records for these purposes." This was one of four fatal chlorine attacks in this span, at least as I noted back in 2014-15, and the only one of those four where the victims were from the town they died in (per VDC listings). The others are all from other towns, "displaced" to a spot that wound up being right under a helicopter dropping 'chlorine barrel bombs.' They all tend to be the opposite of the usual fighting-age adult males: almost totally women and children. That's just as suggestive of segregation as with hostages. "Displaced" might be the way they report these people, probably with made-up names to conceal their true identities as, for example, Alawite civilians kidnapped from nearby Ma'an in February. VDC: all Idlib CW deaths in this span = 3 total from Telmenes. * Mahmoud Abdul Razaq Hashash "Nawas" child-male, age 7, died 4-21 "Martyred due to exposure to Chlorine gas which was contained in a barrel bomb shelled on his house, delivered by the government helicopter"
* Maryomeh Abdul Razak al-Hashash"Nawas" child-female, age 14, from Telmenes, "Martyred with her brother due to exposure to Chlorine gas which was contained in a barrel bomb shelled on their house on 21-04-2014, delivered by the government helicopter"
"A Reuters photograph of another young boy who had been transferred to a hospital closer to the Turkish border showed him lying dead on a stretcher with blood around his mouth. Medics said he had been exposed to chlorine gas at Telminnes. Videos from the site of Monday's bombing showed the same yellow canisters, this time twisted from an explosion." 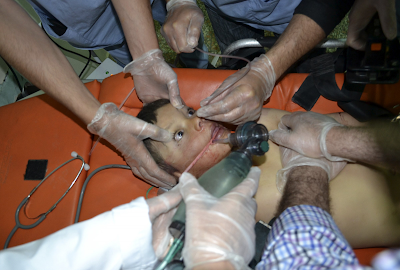 The boy has eyelids pulled open wide, no red eyes, as usual for chlorine exposure (and as reported to the OPCW). But a lot of red-pink coming out his nose, soaking into the gauze across his mouth, and suctioned up a tube from his airways, as if he breathed in something caustic. Why it was breathable but didn't affect his eyes seems strange, but it wouldn't be the last time we'd see that. His torso is oddly yellow in color. I don't know what that could mean, but it's notable. It's said he turned blue, but if so it was after this medical intervention. The forensic report further stated that the remnants seen in v04 [a video provided by a witness] are not likely the carrier of the explosives that caused the crater (“pit”), since the device would have fragmented at the top and sides dispersing into smaller pieces, like the remnants in v04. The munition would only have carried a small amount of explosives and could not have caused a crater of this size. 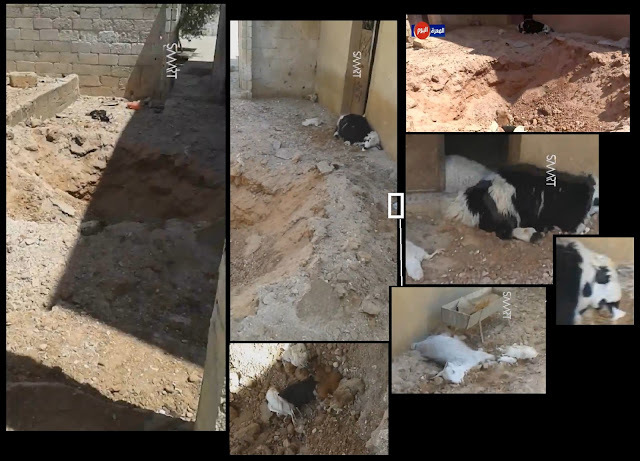 In addition, the bodies of the dead animals seen in v04 look clean and intact, making it highly unlikely that they were in the backyard or at close vicinity when the device causing the crater detonated. This screams of a scene that has been tampered with, but the authors of the report don’t even point that out explicitly. Instead, they merely conclude the discussion of the evidence about this impact by saying that, “as a result of these inconsistencies, location #1 was disregarded for further investigation”. "Indeed, their conclusion against the regime is based entirely on the second location, where another impact was observed. But as the report itself acknowledges, “given that v02 [another video provided by a witness] has been taken two days after the incident, it is possible that the remnants may have been moved from the initial point of impact”. (It should be noted that v02 also documents the impact at the first location, so the witness who provided it also shot a scene that was clearly tampered with. He may not have been aware of that, but it obviously casts doubt on the reliability of that video, a point that is not even discussed in the report.)" Moving remnants is the main reason other incidents were left unclear. It doesn't do much to suggest initial planting, just removal after the first videos. As seen below, the animals are gone too. Lemoine then discusses seized chlorine from Aleppo, possibly moved here - more specifically, SyGov had "barrels containing chlorine gas" and unknown chemicals stored in two specific homes in Kafr Zeyta the OPCW should look into, but they were prevented by the side with apparently fake videos. "24. 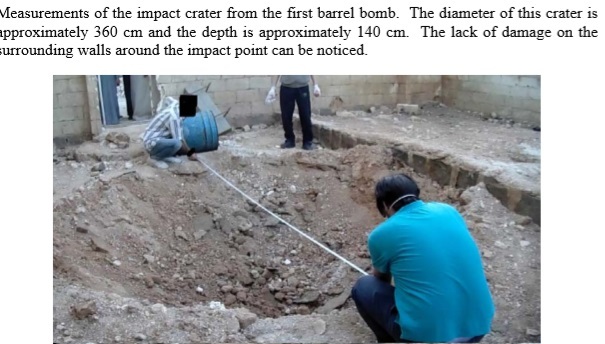 According to the forensic expert analysis, the crater (“pit”) in v02 and v03 is caused by a detonation, but the origin of the detonation is probably an explosive charge of 5 to 10 kg TNT-equivalent buried in the ground." It's not clear why someone would do this, bury explosives in someone's barnyard, and then detonate it. I'm no expert, but an explosive warhead that goes off late after it hits the soil might look similar. There is a possible direction to the dirt piling, towards the raised side, but that's mild or perhaps my imagination. But note below how much soil is just missing. No simple thud caused that. Much was blown far up and drifted some distance before settling across the neighborhood. This huge crater does require a blast that wound up leaving no marks, as if a bunch of dirt absorbed most of its violence. Of course animals with no wounds would be taken as victims of the gas, not an explosion the opposition's story doesn't even include. 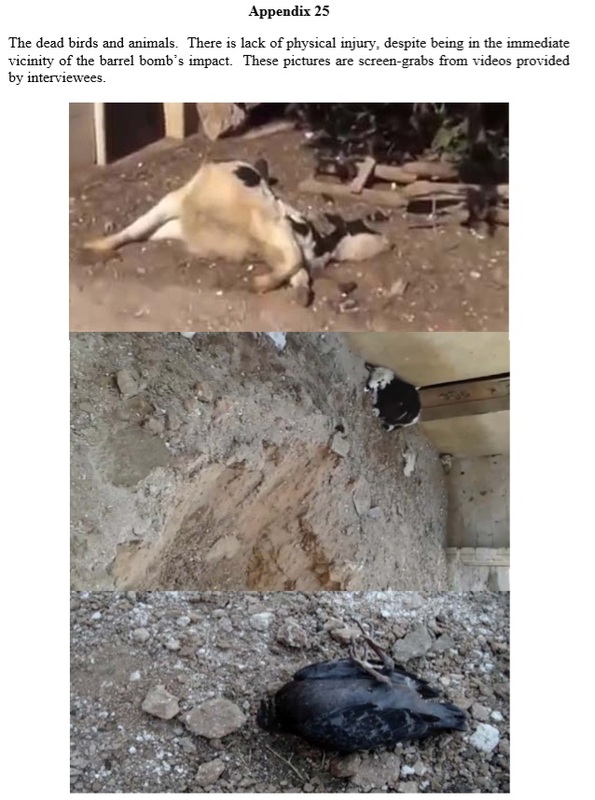 Did they all come out of the barn and the coop just to flop over dead or like the chickens, tumble down into the crater? That seems possible, but this scene doesn't line up anyway. That evident blast would probably vaporize or disperse any toxic agents too much too have any effect. As for the unharmed animals: the December report's appendix 25 shows a dead cow from location #2 that doesn't help here (top), then in the middle, a goat and half the crater from site #1, from rotated video, but there flipped backwards from the actual video. The bird is I think also from location #2. Below is my location #1 view from 2 videos: left rotated frames taken from street side. right + below, details on the dead animals around and in the crater. The black-and-white long-haired goat (or some kind of sheep? an ungulate) may be foaming from the mouth, but that would be very vivid white foam, and thick. That can happen. Behind him is a door into a barn area with a sheep, a trough and perhaps a few more bodies, I forget. It seems mostly empty. "Metadata of V04 include timestamps that indicate 20 April 2014 as the creation date, one day before the incident. It is noted, that metadata depends on the settings of the recording device used and can be altered." The alteration could go against the ones that did fit just as well. But they're right that this is inconclusive; a fuller set of data could show more or less reason for suspicion, but couldn't prove anything. 29 April 2014, stating that soil samples from Kafr Zita and Talmenes “were found by a chemical warfare expert to contain traces of chlorine and ammonia”. ... the details of the analysis and the chain of custody for these samples have not been established. 31. Another source had collected samples “in Talmenes at the end of April”. This source shared its analysis results, stating that chlorinated compounds, as well as traces of TNT, had been found in the soil and gravel. However, the source cautioned that it had no scientific evidence of the use of chlorine. 32. Another witness mentioned the presence of a likely foreign non-governmental organization which also took samples. The Mechanism did not have direct access to any of the samples. 52. ... According to a witness, ... Despite a smell of “rotten eggs”, the witness did not feel any symptoms and did not see any injured people; just those in panic..."
"burning sensation in the eyes; redness of the eyes; itchy eyes; excessive tearing; blurred vision; a burning sensation on the face and exposed skin; a burning sensation in the throat; coughing; difficulty breathing; shortness of breath; a feeling of suffocation; excessive nasal discharge; watering in the mouth; nausea; vomiting; abdominal pain; diarrhoea; headache; generalised weakness; drowsiness; disorientation; feeling of panic; and loss of consciousness." Burning/irritation, coughing, some discharge is caused by chlorine. The rest of this is not. In fact few have noted the unknown second chemical in these 2014 chlorine bombs - a light-yellow powder in small plastic tubs. I'll be coming back to that. 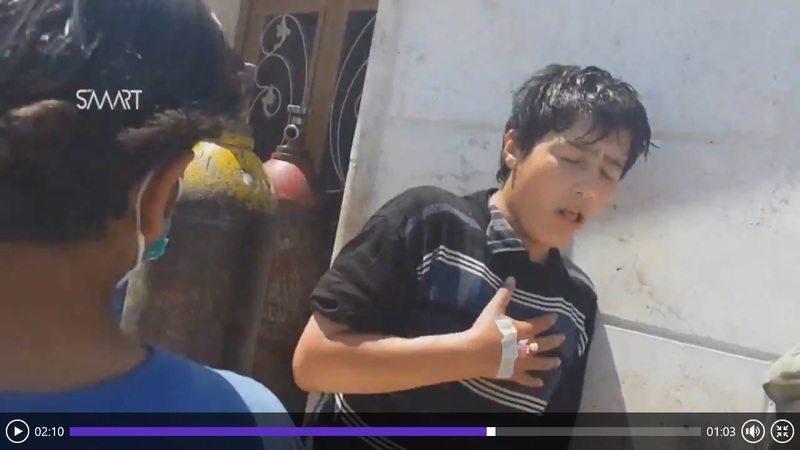 One video shows many gas cylinders in front of a busy clinic, as armed men and civilians cough and transfer between vehicles frantically... this boy has a catheter in his right hand from prior medical treatment. But he's coughing and gasping badly. Some people take him off for a second round of help. Bottom view shows the yellow canister with a marking. did not include any information on the use of chlorine gas or affected people. 32. The Government provided a picture of the type of munition supposedly used at location #2. The munition shown in the photograph has a number of significant differences as compared with the remnants seen in the other pictures and videos related to location #2. That munition is rocket-propelled, with at least eight fins. No remnants of this kind were documented at the site. 20. 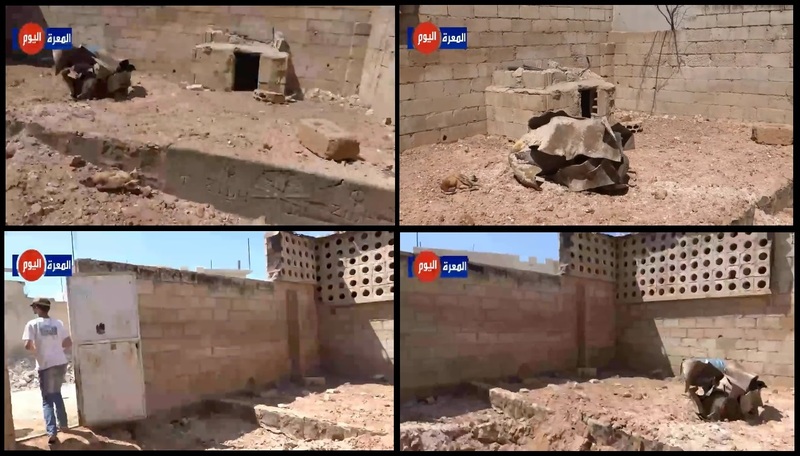 The Syrian government "provided the name of the owner of the house that had been targeted … The name corresponds to the name of the owner of the house at location #2. The Government had stated that this person had died in the attack; however, this person was interviewed by the FFM several months after the attack..."
51. again, the government says the attack at site #2 "killed the owner (name provided) and his child. However, a witness interviewed by the FFM later identified himself as this person (i.e., the owner of the house and father of the child that died in the attack). He had 2 children die - allegedly. 52. ... 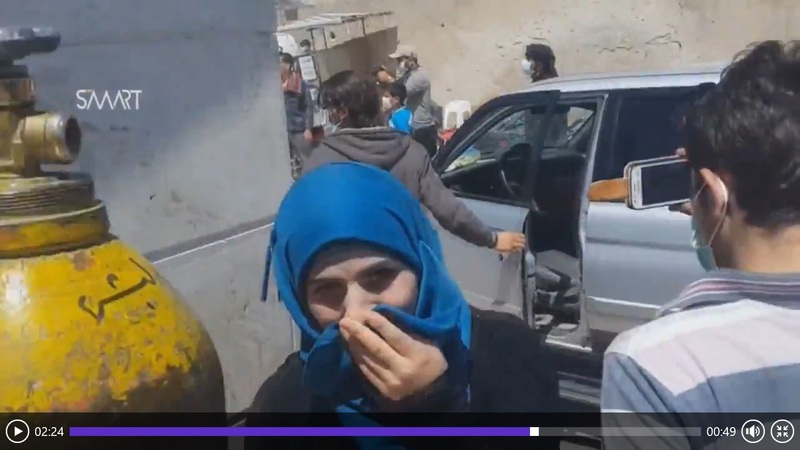 According to a witness, armed opposition fighters spread the information about the use of chemicals after the explosion, causing panic among the population. The same people also provided face masks to people and told them to leave the village. Despite a smell of “rotten eggs”, the witness did not feel any symptoms and did not see any injured people; just those in panic. The witness attempted to enter the hospital, but was denied access. The same witness stated that people who were referred to other hospitals came back to town two days later, with no visible signs of injuries. 12. Someone blamed ISIS/ISIL, saying they had a presence there the JIM found no information on, and tried to lauch a regular rocket from one of these homes, had it blow up and kill them with unknown chemicals. The JIM rightly dismissed this as an apparent politically-lotivated bad guess.